This pioneering work is about the traders, trappers, and explorers in the vast area that would become Oklahoma, Texas, Missouri, Arkansas, New Mexico, Kansas, and Colorado. 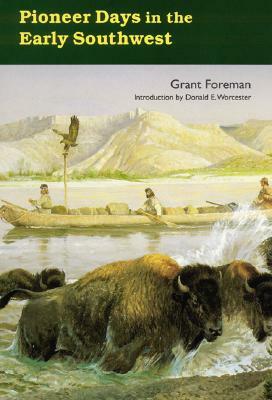 Foreman describes the early explorations of the French and Spanish in the Louisiana Territory and often focuses on the junction of the Verdigris, Grand, and Arkansas rivers, known as the Three Forks, a trading and military center from which the conquest of a large part of the American Southwest was achieved. Viewed in historical perspective are the business enterprises of A. P. Chouteau and others; treaties with the Indians and warfare between the Cherokees and Osage; massacres and disease epidemics; garrison life at Fort Gibson and the visits of writer Washington Irving and painter George Catlin; expeditions into the Southwest led by Colonel Henry Dodge, Captain Benjamin de Bonneville, and others; Sam Houston's sojourn in Indian country; and warfare on the Texas border. Description: This pioneering work is about the traders, trappers, and explorers in the vast area that would become Oklahoma, Texas, Missouri, Arkansas, New Mexico, Kansas, and Colorado. Foreman describes the early explorations of the French and Spanish in the Louisiana Territory and often focuses on the junction of the Verdigris, Grand, and Arkansas rivers, known as the Three Forks, a trading and military center from which the conquest of a large part of the American Southwest was achieved. Viewed in historical perspective are the business enterprises of A. P. Chouteau and others; treaties with the Indians and warfare between the Cherokees and Osage; massacres and disease epidemics; garrison life at Fort Gibson and the visits of writer Washington Irving and painter George Catlin; expeditions into the Southwest led by Colonel Henry Dodge, Captain Benjamin de Bonneville, and others; Sam Houston's sojourn in Indian country; and warfare on the Texas border. Grant Foreman is highly regarded as an authority on the Five Civilized Tribes. His career is noted in an introduction by Donald E. Worcester, a professor of history at Texas Christian University and well known for such books as The Chisholm Trail: High Road of the Cattle Kingdom.